Traditionalists may say that pizza should be served with wine, but most Americans prefer beer with their pizza, and for good reason. 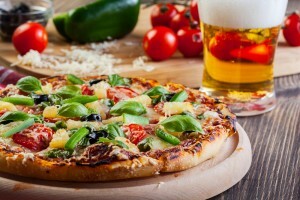 A cold brewski with a hot, gooey slice of pizza offers a perfect contrast of textures and temperatures, and is popular for much the same reason as drinking soda with a pizza – it’s refreshing! Where soda universally goes well with all pizzas, beer requires a more judicious decision. Everyone loves pepperoni pizza. Fortunately, the beer recommendations come with a bit of variety to suit your flavor preferences. Negra Modelo, a popular Mexican amber, is a good casual choice. A malty Pilsner, such as the Sam Adams Noble Pils, will compensate for greasy pepperoni. Hop lovers would do well with an IPA – any variety will do. The hops in the IPA counterbalance the spiciness of the pepperoni. Kids love Hawaiian pizzas, and you grown-ups will too when you eat it with a Hawaiian beer. Kona Brewing offers a diverse selection of Hawaiian made beers, but their popular Longboard Lager, with its light, refreshing taste, is an excellent choice. You can even save a couple of dollars and drink a Budweiser. Vegetarian pizza is a popular choice for both vegetarians and meat-lovers who are trying to cut back. Fortunately, beer tastes great with veggie pizzas too. A Belgian-style white beer is recommended, and Blue Moon always delivers. Widmer Heffeweizen is also an awesome choice. No matter what you’re in the mood for, there is Fremont street pizza in Las Vegas. Order take out, bring it home and have a beer party.